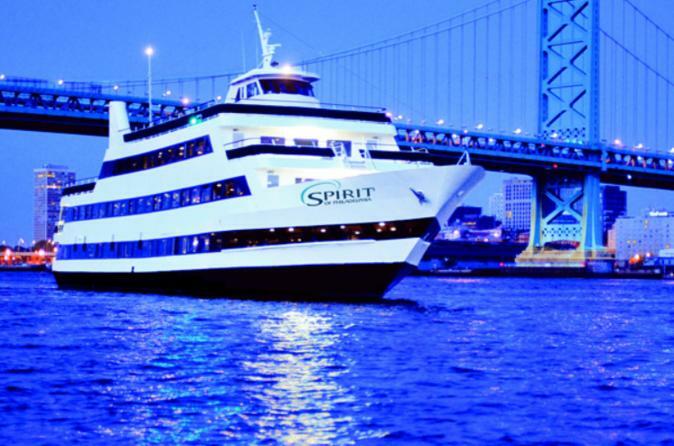 This dinner cruise on the Delaware River features a delicious buffet meal, live entertainment, an amazing DJ, and dancing. Enjoy the view of the Philadelphia skyline or head to the dance floor. Bring that special someone or a group of friends for three hours of fun on the water. Three climate-controlled interior decks with panoramic windows allow for a perfect view of the Philadelphia skyline. As the ship departs from Penn’s Landing, head to the elegant dinner buffet, complete with salads, entrees, and desserts. The food is prepared fresh on the ship. Sample everything or simply find some favorites. Great food and entertainment go hand-in-hand on this cruise, so take in the live performances during dinner. Grab a cocktail at the floating rooftop lounge, head to the spacious observation deck for a moonlit stroll under the stars, or hit the dance floor with one of the hottest DJs in the city, spinning top-40 hits from a variety of genres.